The Newlands Valley on the western side of the Lake District is one of the quieter valleys in its National Park although quite close to the busy town of Keswick and the A66 road. The thinly populated valley bottom consists of mainly farms and tourist accommodation and is overlooked by the fells of Barrow, Causey Pike, Cat Bells, Ard Crags, Knott Rigg, Maiden Moor, High Spy, Dale Head, Hindscarth and Robinson offering superb fell walking. The Newlands horseshoe is 8.75 miles starting and finishing at Little Town. Situated on the steep slopes of Ard Crags above Keskadale Farm is Keskadale Oakwood, an ancient woodland, which is a Site of Special Scientific Interest and a Special Area of Conservation. The valleys main hamlet is Stair which is the location of the Newlands Adventure Centre and about 1½ miles north of Stair in the only pub in the valley the Swinside Inn. Further up valley the hamlet of Little Town consisting of a farm, a few cottages and a church has been made famous by the writings of Beatrix Potter, whose 1905 children’s book “The Tale of Mrs Tiggy-Winkle” is based in the area. At the most southerly part of the valley is KesKadale Farm, a traditional sheep and beef cattle farm, which has been in the Harryman family for generations and offers accommodation. Newlands Hause at the end of the valley provides a car park which sits at the foot of the slopes of Robinson where the Moss Force Waterfall can be seen coming down from the fell. From the Hause the road descends steeply to Buttermere. The Newlands Valley was extensively mined for centuries. Lead, copper, silver and even gold has been extracted. Goldscope mine on the lower slopes of Hindscarth, which has operated since the 16th century, is the most famous mine in the Lake District. It yielded such large amounts of lead and copper that it was named “Gottesgab” (God’s Gift) by the German miners brought over to develop the mine in the early days. The mine closed at the end of the 19th century because the main shaft had gone so deep it had become uneconomic to pump water from it. The other mines in the valley are Barrow lead mine closed in 1888, Yewthwaite lead mine closed in 1893 and the Dale Head copper mine closed at the end of the 18th century. Causey Pike at 637 metres (2090 feet) is one of the most distinctive fells when viewed from Derwent Water and Keswick due to its distinguishing summit “noble” which catches the eye. It rises up between Whinlatter Pass and Newlands Pass and is separated from Barrow and Outerside fells to the north by Stonycroft Gill. The last 20 metres of ascent to the summit is a rocky scramble. The summit is a narrow ridge with the highest point being the “noble” but with four other smaller bumps of the same height that follow on towards Scar Crags. The summit provides amazing views of Derwent Water, the Newlands Valley, Skiddaw, Blencathra and the Helvellyn range. The annual Causey Pike Fell race starting and finishing in the Newlands Valley with a distance of 4.5 miles (7km) takes place in March. Scar Crags at 672 metres (2205 feet) is part of the long ridge adjoining Causey Pike and Sail. It has steep craggy flanks on its southern side which fall away steeply to Rigg Beck, while the northern slopes are less steep and grassy as they drop to Stonycroft Gill. The top of the fell is grassy and often muddy with a small cairn and is part of the Coledale Round. 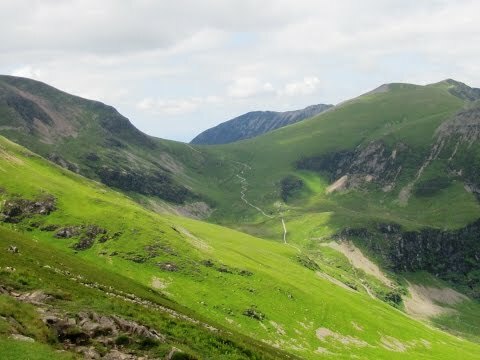 The Coledale Round is an 11 mile walk starting and finishing at Braithwaite or Stair and includes the fells of Grisdale Pike, Hopegill Head, Grasmoor, Eel Crag, Crag Hill, Sail, Scar Crags and Causey Pike. Sail at 773 metres (2536 feet) has a grassy heath summit with a small cairn. Sitting below Crag Hill and above Scar Crags and Causey Pike the view to the south west brings Buttermere and the end of Buttermere Lake into sight. From the side of Stonycroft Bridge we take the path opposite uphill on the stone steps. We keep heading forwards following the well walked path uphill with Stonycroft Gill on our right. Eventually we reach the base of the unmistakable “noble” of Causey Pike. We now scramble up the rocks to the summit. From here we head forwards taking the distinct path following the ridge over Scar Crags. We then drop steeply downhill to a cross roads of paths and head forwards steeply uphill on the zigzag path to the summit of Sail. After admiring the views *and a cup of tea* we retrace our steps back down to the cross roads of paths and turn left downhill towards the path in the valley bottom. We keep following the path as it bears right to pass below and to the right of Outerside. We keep heading forwards downhill picking up the track following Stonycroft Gill on our right back down to the bridge and our parked car. Approx 5 miles allow 3 – 4 hours using OS Explorer Map OL4, The English Lakes North-Western area. Start point: Stonycroft Bridge near Stoneycroft, south of Braithwaite. Stoneycroft is south west of Keswick located at the base of Barrow and Rowling End fells. Following the A66 from the east take the B5292 for Braithwaite. On entering Braithwaite take the first left then bear left and follow this road and the signs for Buttermere. Stonycroft Bridge is approx 1.8 miles down this road. Parking: free parking at the side of the road. There is no car park. There are no public toilets or refreshments. There is a pub the Swinside Inn about a mile away towards Portinscale. The nearest facilities are at Keswick where there are public toilets in the car park at the back of the Market Place near the centre of Keswick and also at the Theatre by the Lake and the Leisure Centre. For refreshments there are ample shops, bakeries, cafes, take-away and pubs to choose from in Keswick.